PanARMENIAN.Net - Armen Gyulbudaghyants has been confirmed as head coach of the Armenian national football team, the country's Football Federation said. Gyulbudaghyants has previously managed the national youth teams, as well as several clubs including Pyunik, Banants, Alashkert and Impulse. Armenia's next fixtures will be against the teams of Gibraltar and Macedonia on October 13 and 16, respectively, within the UEFA Nations League. 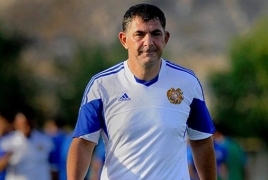 Former chief coach Vardan Minasyan was re-appointed in the position in April, but resigned several months later.